Microsoft just released -- or should we say, Apple just approved -- version 2.0 of the Bing search app for iOS devices. In addition to several other new features including integrated Facebook Likes on search results (really!?) and in-app checkins to Facebook and Foursquare, Bing now comes packing Streetside, something that first blew us away as Street Slide when it was still in the labs at Microsoft Research. Unlike Google's Streetview that requires a lot of forward- and back-clicking and turning in order to get a feel for a location, Streetslide provides a more comprehensive view of the shops and businesses in an area by letting you strafe down the sidewalk while zooming in and out of the buildings located on each side of the street. We took it for a brief spin (literally) and came away impressed. You won't find Streetside implemented for all locations yet (for example, San Francisco's Make-out Room was found on Streetside but the Slanted Door restaurant wasn't) but they do seem to have large swaths of major cities covered based on our brief testing of Chicago, Seattle, New York, and San Francisco. Sorry, nothing yet in London and Amsterdam but maybe you'll have better success searching your own neighborhoods. See the full list of what's new after the break in addition to a Streetside demo from Bing's architect Blaise Aguera y Arcas -- unfortunately, we're not seeing the impressive Panaroma feature he mentions in this release. Update: We've been told that Facebook Likes, like Panaroma, like totally didn't make it into the app release. It's a web search results feature only for the time being. Quickly find the perfect restaurant based on your price range, cuisine, atmosphere, or location. Easily find great movies by name, location, or theater. Use the Plans feature to plan a night out, a dinner and a movie, or any event you want. See what plans your Facebook friends like and read their comments. More transit directions to help you plan your commute. Real-time transit updates for Boston, San Francisco and Seattle (more cities to come), show you if a bus is on time, early, or delayed, with predictions for arrival times. Standard transit routes for 11 cities including Boston, Chicago, Los Angeles, Minneapolis, New Jersey, New York City, Philadelphia, San Francisco, Seattle, Washington DC, and Vancouver BC, with more to come. 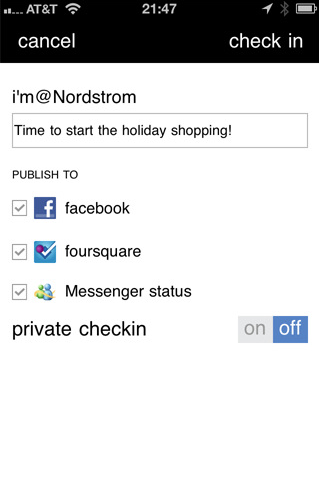 Use reminders to get a notification when you're nearby a business or location where you have an errand. Add a reminder and you'll stop forgetting to pick up the dry cleaning. Check in to Facebook, Foursquare, and Windows Live Messenger, without leaving Bing. Improved homepage layout and design for easier navigation and discoverability.